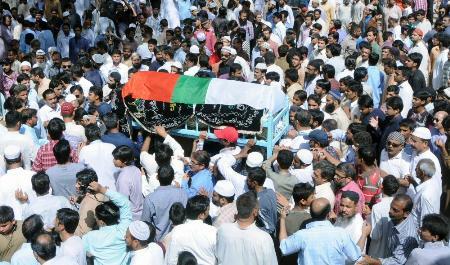 Former organizer of APMSO Sector B Syed Shiraz Azfar was laid to rest today in Shuhada Graveyard in Yasinabad. He was gunned down by armed terrorist near Payala Hotel. The funeral prayer was offered in Jama Masjid Gulberg FB Area Block 12 after the Friday prayer. Members of the MQM Co-ordination Committee Waseem Aftab, Wasay Jalil, Tauseef Khanzada and Saif Yar Khan, office-bearers of the Karachi Tanzeemi Committee, APMSO and various wings of the MQM working at Nine Zero, former MNAs, MPAs and a large number of workers belonging to the FB Area Sector attended the funeral. The funeral prayer of the personnel of the City Warden Naseerullah was offered in Adil Jafri Shaheed Ground. He was also buried in the Shuhada Graveyard. Members of the Co-ordination Committee and office-bearers of the Karachi Tanzeemi Committee of the MQM attended the funeral of Naseerullah.